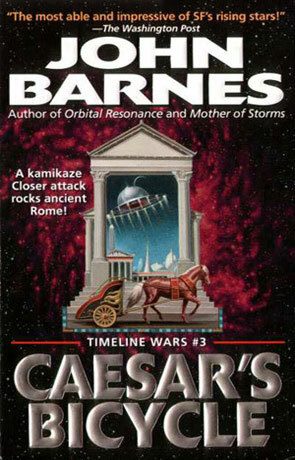 Caesars Bicycle is a science fiction novel by the American author John Barnes. Mark Strang is a Crux Ops, which means that he hops around in timelines fighting the Closers (your basic timeline hopping bunch of slave drivers). This is the third book in the Timeline Wars series (the first two being Patton's spaceship and Washington's Dirigible) and the first one that I've read as I couldn't find any of the first two anywhere. I've probably missed all the references to the first two books in this one, but other than that it wasn't a problem jumping into the series like that. Most of the story takes place in an early Roman empire (the why isn't really interesting), where both the Closers and the Crux Ops are trying to make by furthering the Romans technological development and trying to make their own "horse" win, thus making the future of this timeline partial to either the Closers or Crux Ops. Barnes has lots of fun mixing Roman culture with fairly modern technology, and if you are just a tiny bit interested in history you will too. Caesar's Bicycle is a nice action driven story, with a built-in history lesson. Just remember that this is a history lesson to an alternative timeline to ours (some of it anyway). Written on 1st June 2000 by TC.